a. Instead of using hot glue, the marble run track can be made with small cut up pieces of straw that get taped down. This way, a child can be involved in the constructing process without worry of using a hot glue gun. Before starting the construction phase, show the child photos of the milky way galaxy, a sample of a marble run using straws, a demonstration of how to tape down the straws (add a strip of tape over the straw) and allow the child to problem solve how to align the straws into a circular arrangement so that the marble can find its way all the way into the hole. Stumbling over me, R shouted “wow” as she grabbed the shooting starts and meteors I had set out for her. I asked her to sit patiently while I positioned the black hole. Of course, that’s not an option for an excited toddler! This activity was used to encourage R to throw forward, though she also threw backwards, sideways and up into the air. I cut a hole into a square piece of cardboard and painted the surface using blue Crayola kid’s paint, streaks of black ink from an ink pad and squirts of Perfect Pearls spray. I made meteors by wrapping two plastic balls in foil (so that less foil could be used) and adding some details with black paint. 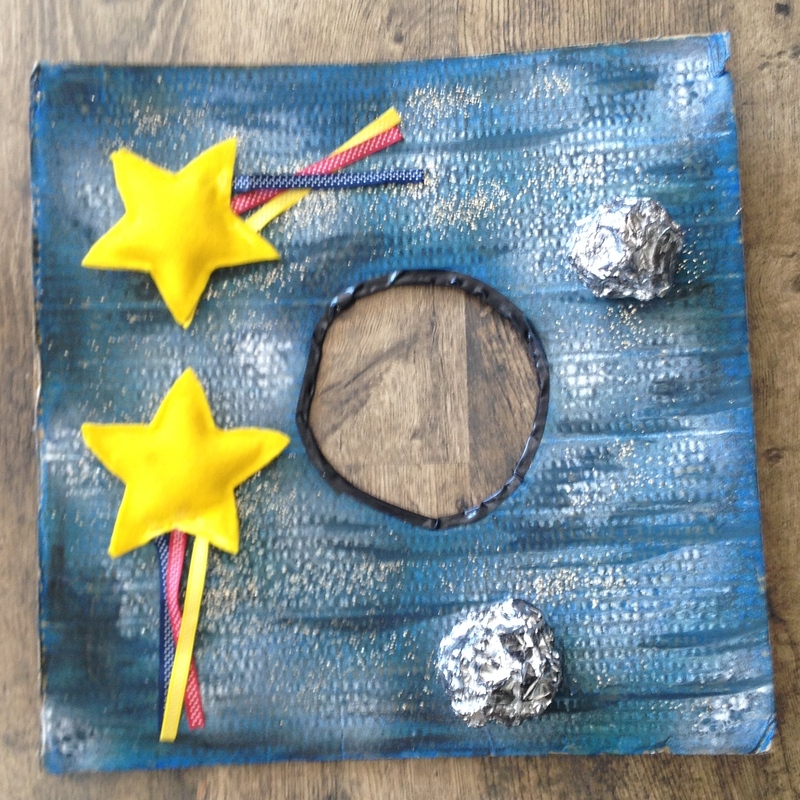 The shooting stars were made with two star-shaped felt pieces glued together and stuffed with rice. I added ribbon for embellishment. I don’t have a sewing machine, so I used liquid stitch glue to seal up the two felt pieces together. a. Have the child slowly move further and further back as s/he attempts to toss the shooting stars and meteors into the black hole. b. Add to the challenge by placing the black hole at different heights before tossing the space objects. c. If playing with more than one child, allow the children to play cooperatively. 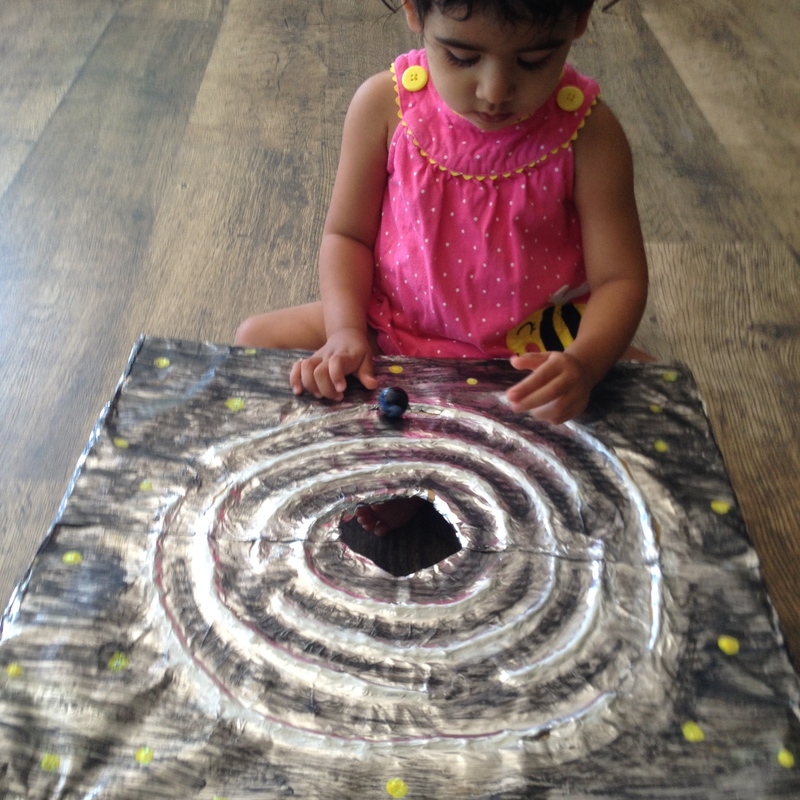 Use a timer and have the kids work together to get the space objects into the black hole before the timer goes off. Today’s guest post comes from one of my Instagram mommy friends. You can see the original post here. For this activity, she had her son order planets onto straws stuck into styrofoam blocks that were labeled with the ordinal numbers based on their distance from the sun. As AA placed the planets onto the straws, his mom named the planets for him. He enjoyed the activity so much that he was at it for 30 mins and still wanted to play more for days after it was introduced. a. Imaginative Play. 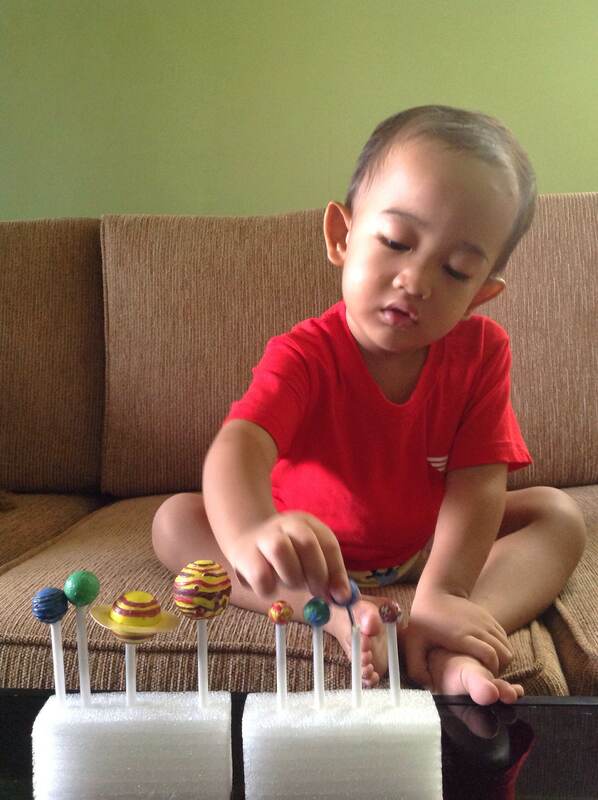 Once completing his task, AA began to play imaginatively with the planets on the straws. He blew at the planets as if they were candles on a birthday cake. He and his mom sang “Happy Birthday” together and a song called “Let’s Blow the Candle” which is a song in their first language. Purti Dina especially enjoyed it when her son pretended to lick the planets as if they were lollipops and announced, “Mama, Here is Saturn lollipop”! Thanks, Katie! Looking forward to seeing your space theme!! So cool! Love this craft! Thanks, Beth! Was lots of fun for us all! Awesome ideas. I like your pictures! The photos are really helpful in seeing how the activities would work. 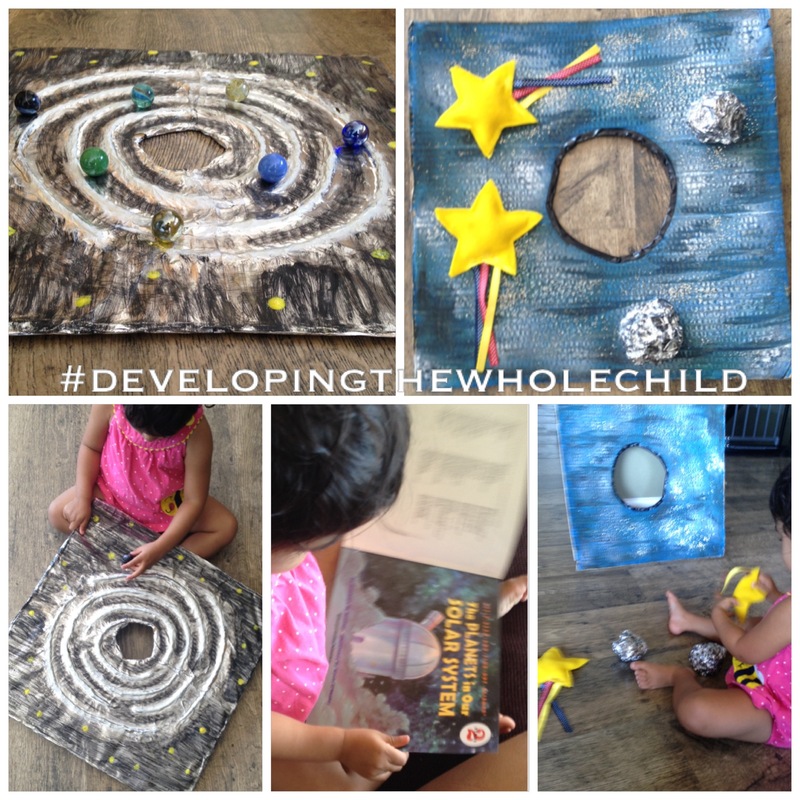 You have some great ideas for space themed kids activities. The marble run looks fun and I am already going to make some moon sand from the first post. Love hearing these ideas! Thanks, Amanda. I’m so happy to hear that you’re enjoying the posts. Okay, my first comment disappeared. But I was saying that I love the marble space run and I’m pinning this for us to try one of the coming weekends! Thanks! You’re welcome! Would love to see pictures of how your marble run turns out! Loving the spaced themed ideas! Have to keep them in mind for when my little ones get a bit older. Wow! These are great projects! I will have to keep these in mind. Thanks!